The Hariom Ashram is continuosly working for the better future and welfare of such category of children who can’t even dream for such future. Once they come to Hariom Ashram, they start dreaming, and than its our responsibility to make their dreams real. Among 120 children not every once is good in studies, because of their family background and past conditions their education had been affected severly. The condition is that a student from a remote village stuying in goverment school had passed class 6th, but still unable to read even the Hindi text. So we don’t force such child to study. Though its mandaory to be in class, but the study load is still less on such child. These type of child are given with other practical knowledge, such as music, dance, computer, plantations, pottery, animal husbandry, modern farming, driving, cooking, event managment, etc so that they could be self reliant. 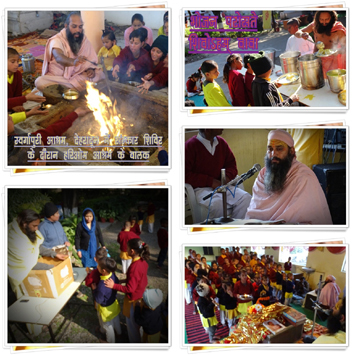 The monthly expenses of Hariom Ashram is more than 3 Lakhs. Means over 10,000 per day. The Hariom Ashram had no fix source of earning, neither any link with any commercial activiy for earning. Whole of the expenditure is done by the contribution from the society. This in itself is a very big achievement. Pujya Maharaj shri and Hariom Ashram had lots of achievements in the span of this short period of time. The whole list of achievement and awards will be updated soon. Please keep in touch. The site is under maintainence.